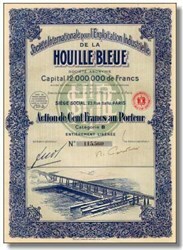 Beautifully engraved Certificate from the Industrielle De La Houille Bleue issued in 1927. This historic document has an ornate border around it with a vignette of a powerplant, dam, bridge, and ships traveling through locks. The company was raising money for a tidal power factory on Rancid River situated to the west of France. This item is hand signed and is over 73 years old.